The world's only Grammy nominated Beatles tribute band. Our first appearance on national television is this weekend. We know it's official because they've sent us our plane tickets to New York and back. We've never been to New York before - not as a group. Each of us has walked, lived or worked there as individuals, but this is our first time as The WannaBeatles. We're excited. This Saturday, Feb. 1, we will tape a segment for Huckabee, on Fox, which will be aired that night at 8 pm. We have been told that our musical segment is four minutes. We've also been told there will be a "playoff" opportunity - maybe ten seconds, maybe two minutes - where we play as they fade to a commercial break. We have assembled a medley of Beatles songs that lasts approximately 3:52. 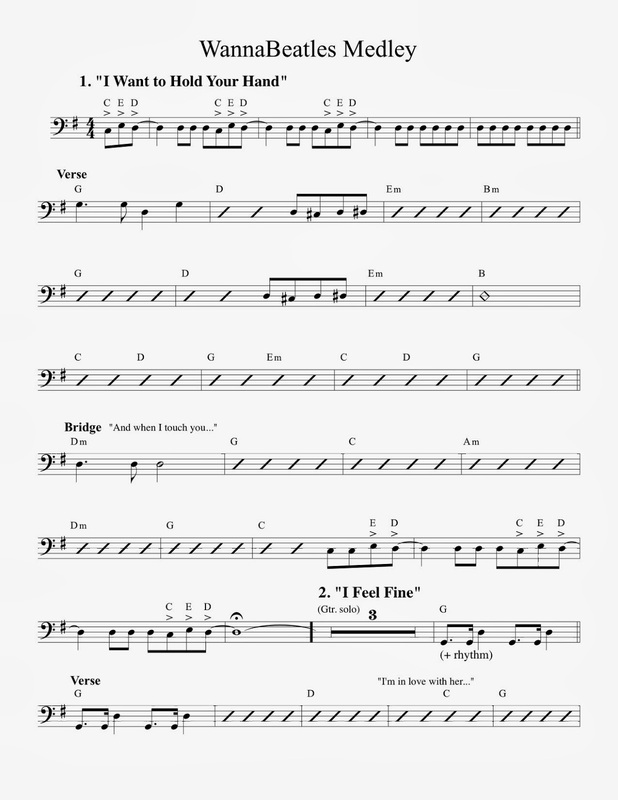 We have spent the last two weeks trying out different versions of this medley, and rehearsing it. We've also prepared our song "Because They Were Fab" to use in that "playoff" slot. The songs we've settled on are "I Want To Hold Your Hand," "I Feel Fine," "Help! ", "Sgt. Pepper's Lonely Hearts Club Band," and a small concluding piece of "She Loves You." Gov. 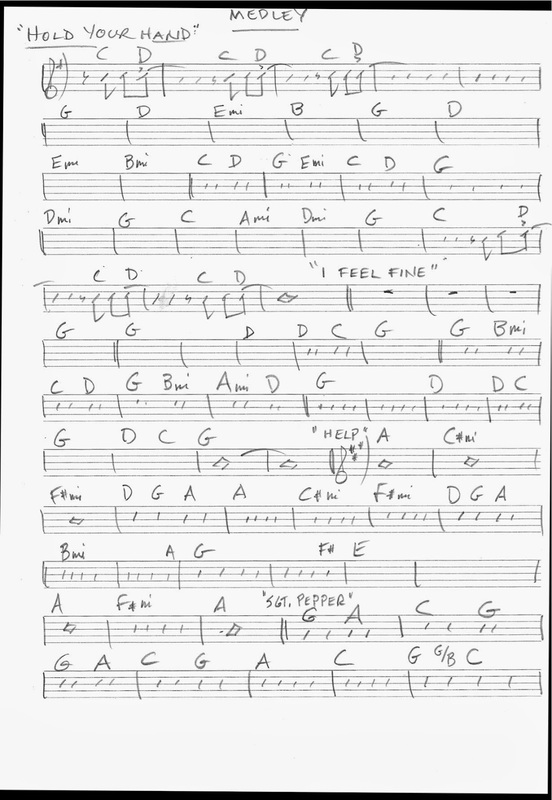 Huckabee is our host for the show, and also our bass player, so we've written a chart for him. We're honored to designate him "the Fifth WannaBeatle" for this weekend. Nathan, our resident orchestrator, has made up a professional chart of the medley that contains all the actual bass notes from the original Beatles songs, along with lyrical cues and tempo markings. I have taken that information and condensed it into a simplified chart that has only the notes for the chord that a bassist would need to know. Nathan's chart is three pages long; my version is a page and a half. We'll give the Governor both options, and let him decide. Knowing that we're on television has intensified our attention to the details of our instrumental and vocal parts. For example, we've been playing "I Want To Hold Your Hand" several years without any idea that we were missing something. But WannaBeatle Dave, our resident musical sleuth, has brought to our attention certain notes in the guitar parts of the Beatles recording, which now make our version sound a lot better. In addition to working on details of the music, we've been using Dennis's home studio as a larger rehearsal space, moving some of his furniture out of the way to set up in a more realistic stage arrangement. 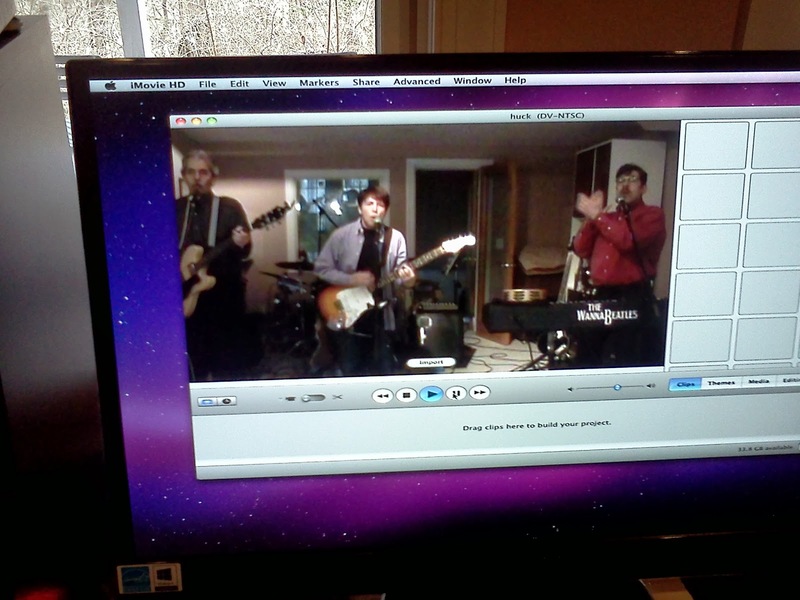 And Dennis put his camera on a music stand and filmed our performance, so we could see what we look like. It's a primitive way to do it, but it's very helpful. We've heard from lots of friends congratulating us and promising to watch or record the show this weekend. We're really looking forward to this opportunity. You can check this blog for more updates as we arrive in the Big Apple and have our adventure. 2014 has barely started, and we've already got things going on. Much of our attention is directed toward the date February 9, 2014, which is the 50th anniversary of the Beatles' appearance on Ed Sullivan. We've been wondering how to celebrate this date for a while, and now we've arrived at a definite event. In partnership with Hippie Radio, we're appearing at Barlines in the new Omni Hotel Nashville, for a special party that's free to the public. The date is Sunday February 9, and the time is 5 pm to 9 pm. Part of the fun will be a video screen showing the original footage of the Ed Sullivan show, and The WannaBeatles playing along with live versions of the songs that The Beatles played on television. Our friend Barb Deniston at Hippie Radio has been putting this together. You can see a picture of Barb with us at the Hippie Radio Christmas party in the most recent blog. We just did a photo shoot yesterday at Barlines, in the Omni Hotel, to help publicize it. 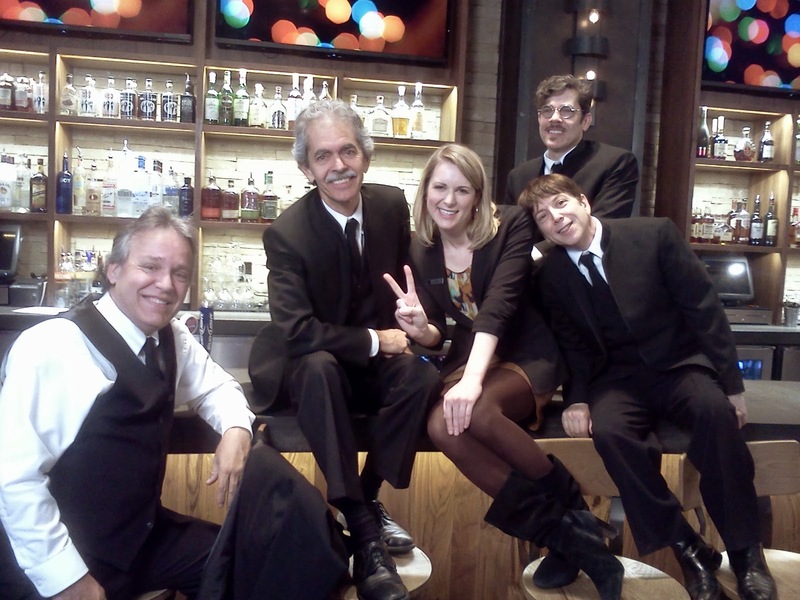 We got to meet Kellie Keyes, the friendly marketing director at the hotel, who was wiling to pose with us at the bar. The photo shoot was also a reunion of sorts for us with Vince Pinkerton and his pal Tommy Terry. Vince and Tommy were the folks who shot and edited our videos from 2012, "We Wanna Meet Paul" and "Oh, Betty!" Thanks to Vince and Tommy for a very creative morning. If you haven't seen the Omni, it's pretty impressive. It's part of a renaissance of downtown, where the new Music City Center has revitalized the blocks south of Demonbreun with new restaurants and attractions. The hotel occupies the block behind the new MCC, which makes it adjacent to the Country Music Hall of Fame, with a pedestrian walkway. The lobby is decorated with lots of country music memorabilia. 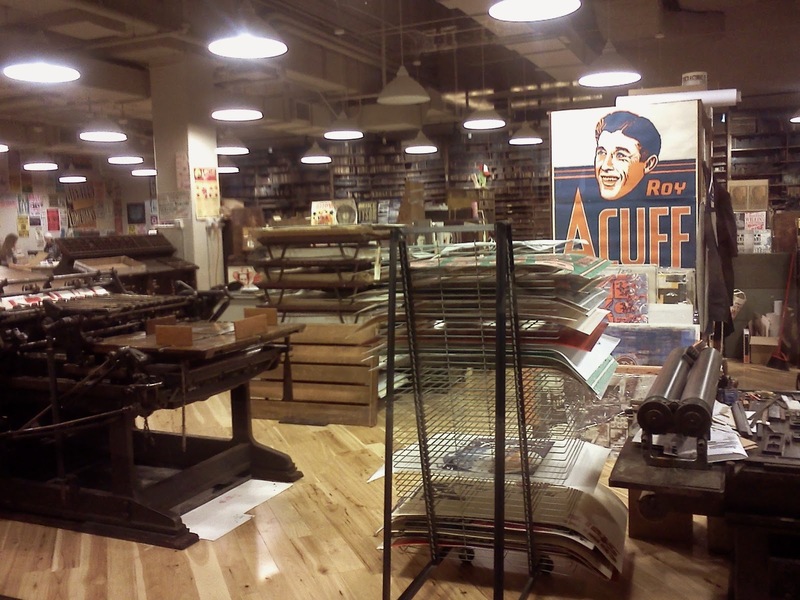 The legendary Hatch Show Print has moved its operations into the hotel, giving it an unique Nashville atmosphere. Our friend Barb at Hippie Radio said she had wanted to create a Hatch Show Print to help promote this event, but they were so backed up they couldn't do it in time. But we certainly appreciate the idea. Barb has more than compensated for that by putting ads on the air. We heard them yesterday, listening to WHPY 94.5 FM on our way to the photo shoot. The ad starts with Ed Sullivan saying "Here They Are, The Beatles!" then sound of Paul McCartney singing the opening lines of "All my Loving." The ad mentions The WannaBeatles, and plays portions of our songs "In '63" and "Because They Were Fab." Hippie Radio is also putting our song "In '63" into "rotation." We're excited about that. In other news, we've been invited to appear on national television ourselves. It's The Huckabee Show on Fox TV, which will be aired on Saturday, February 1. We'll be traveling to New York to do that, to record a four minute medley of Beatles songs, with Gov. Huckabee playing bass with us. That's something you don't see every day. Fortunately, the show pays for plane tickets and hotel accommodations. All we have to do is get to New York and be ourselves. You can read all about the adventure in this blog. 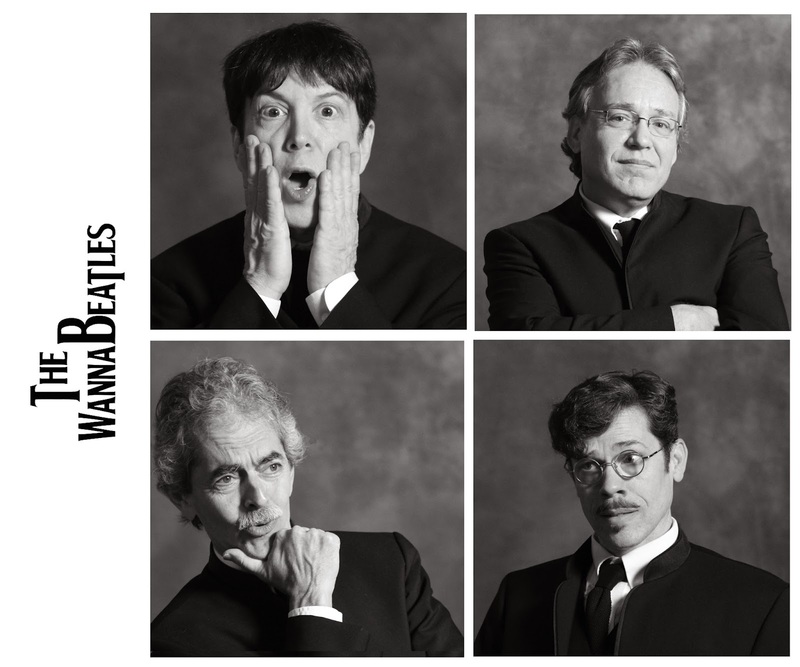 It seems like a good time to say "It's good to be a WannaBeatle."